[New for May-Aug 2014, back for summer 2015 & 2016] After six years of reviewing ice cream, sometimes I start to question if I've kind of become numb to the whole process, or more specifically, has my sense of this and that improved as much as I like to think it has..... so I decided to put myself to the test and buy both the grand version and slow churned version of this limited edition flavor. That's right, two flavors in one review. It's time for a Friday Night Fight! 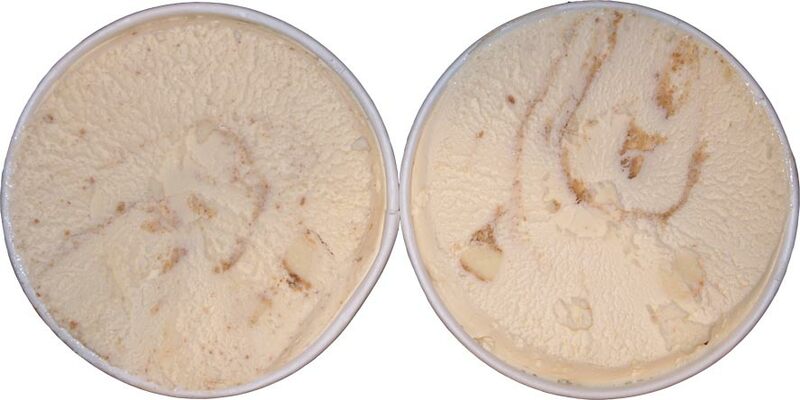 If you look very closely (or click for a larger image), the graham swirl seems to have broken up more on the grand version (left side). I know it could just be luck of the draw, but the slow churned looks pretty plain. I see big cheesecake chunks in both! I take my first bite of the slow churned and it's not bad. 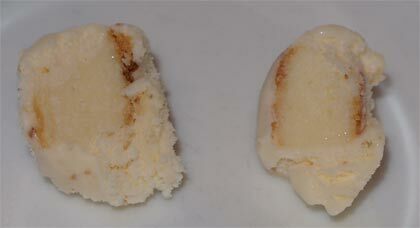 There's just a little cheesecake flavor floating around in the vanilla ice cream (I haven't had any chunks yet). I take my first bite of the grand and it's definitely better, not just texture wise, but the graham has done a better job of infiltrating the base flavor. I wonder if the swirls are made differently? I can't help but think they are which has lead to a better tasting base. I flip back to the slow churned for some more bites and now the gumminess of the base strikes me more. It's not terrible, but when next to the grand version, I gotta go grand. The slow churned is back in the freezer and it's time to finish my snack. Mmmmm, I'm such a sucker for anything graham flavored. I dig how they let the abundant cheesecake bits speak for themselves. I know some of you like a cheesecake flavored base, but pleasant but mild bursts of cheesecake floating in vanilla ice cream is way more my style. In fact, I'm having a little trouble stopping.... wow that's a big hunk of cheesecake I just got! ok, ok, I'm done for round 1. Can't wait for the next round. On Second Scoop: Round 2: Ok, really this was a series of tastings off and on this week. First, yes, the grand swirl is definitely better. They must have tried to keep the fat content lower on the slow churned version, so the slow swirl just doesn't have that richer flavor or bit more solid/gooey texture. It's just more dry with a flatter taste. My wife mentioned the slow churned isn't as good, but it's healthier.... but I just don't know if the nutrition benefits are worth it. I just really like the grand version, and it was great in this waffle sundae. Actually, it was too good as I made several sundaes, including one that I had for a late dinner [I needed a pick me up, what can I say?]. The flavor combo between the grand version, the waffle, and the caramel syrup was just excellent.... but anyway, try the grand version.... or if you want to, try the light version, I won't blame you, but know there is a less gummy, more flavorful alternative. Yay! I've seen this flavor at my grocery store for the last few weeks, but was holding off on buying it until I saw it reviewed here. Now I'm off to treat myself to some "Summer in the City Cheesecake (Grand)"! 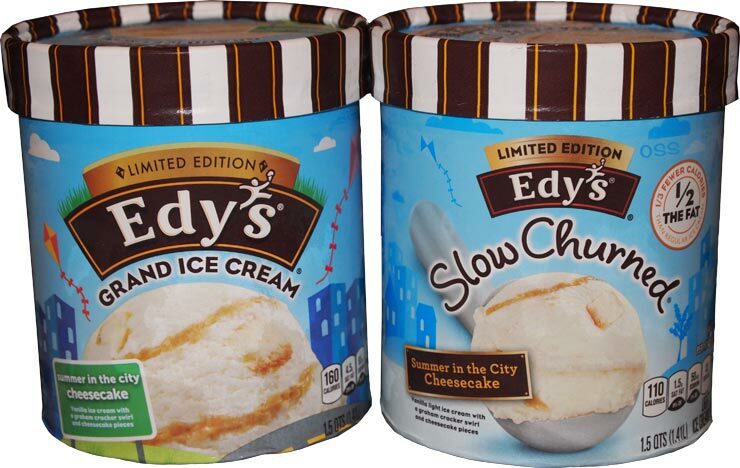 I've had the slow churned version and it's probably my favorite flavor of all the slow churned flavors. I've gotten the Slow Churned twice now. The graham swirl seemed broken up more on the first one. But both times there seemed to be few cheesecake pieces in there. I'd like them to put in more cheesecake pieces.